A dear blogger pal very kindly passed on to me some of her home-made Indian spices which I have been keen to feature with some of my own local ingredients. Although I haven’t posted many Indian recipes before on this blog, South Asian cuisine is one of my favourites. I began to learn to cook during our two-year stint in Delhi, just before the craze for spicy Asian food hit North America in the 70s, and I have been at it ever since. It was in India where I really learned to appreciate local and fresh food, including home-ground spices which made everything from soup to nuts just so much tastier. So when Sonal offered me some of her handiwork, I was thrilled. You can find her fabulous recipes on her blog, simplyvegetarian777 where you will discover some truly original recipes with a strong South Asian influence. Do drop by and check out her fabulous fare. I met Sonal through The Novice Gardener’s weekly event, Fiesta Friday, so it is only fitting that I share these recipes with this week’s crowd. Our co-hosts this week are Effie @ Food and Daydreaming and Jhuls @ The Not So Creative Cook who will be working hard to keep the party lively. The spices Sonal sent me were a tandoori masala, a curry and Kasuri Methi, or dried fenugreek. This latter I intended to use as a garnish and then unfortunately forgot, but I did taste it and it would have made a wonderful accent for the two dishes I did make. For the tandoori spice mix I decided to make a fish dish using local wild pickerel, but you could use any firm fish. Mix all the ingredients except the fish in a bowl to make a paste. Coat the fish pieces with the paste and place them on a grilling pan in a 350 degree oven for about 15 minutes. Turn the pieces over and continue to cook for another five minutes or so, depending on the thickness, until the fish is cooked through. I managed to achieve a nice red-coloured paste thanks in part to the addition of sumac which also goes well with this mixture taste-wise. To accompany this fish I wanted to make a really green curry with ingredients all from my garden. The scapes, garlic, mustard seed and green chili are left over from last year’s crop, but the young dandelion leaves, lily shoots, and some nettles were all picked just moments before cooking. Heat the oil in a heavy skillet and add the mustard seeds. When they start to pop, lower the heat to medium and add the chili and mustard. Cook for 1 minute and then add the curry powder. Cook for another two minutes, stirring continuously. Add the washed, but not dried greens starting with the sturdier ones like scapes and shoots. When they start to turn a brighter green add the dandelion and nettles, cover and cook until they are just wilted. Remove from the heat and drizzle with lemon juice. Categories: edible weeds, fresh water fish, garden vegetable, spice | Tags: curry, dandelion greens, Fiesta Friday, foraged ingredients, lily shoots, local, nettles, pickerel, scapes, simplyvegetarian777, spices, tandoori fish recipe, tandoori masala | Permalink. It seems only fitting that I post one more maple syrup recipe as maple syrup is what is happening at our place. There is still snow in the ground and while a few green edibles are just barely visible, there is nothing but sap for us to harvest. Besides enjoying our own syrup, I had a chance to try some butternut syrup – a much appreciated gift from a sister. Made the same way as maple syrup, it takes four times as much sap, but if you have butternut trees I would say it is well worth the effort, especially since it is not available at the supermarkets. 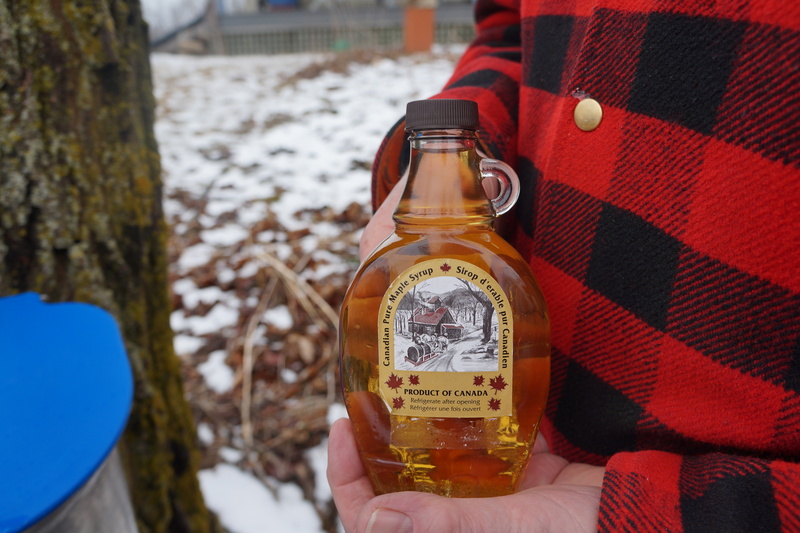 It has a buttery, fudge-like flavour and on pancakes or waffles is second only to maple syrup. For Angie’s 63rd Fiesta Friday, which I am pleased to be co-hosting this week with Julianna at Foodie on Board, I made gluten-free cornmeal muffins with a buttery, maple date sauce. I hope you will drop in and see what Angie’s other guests have prepared. If you have a recipe you’d like to share, just follow the guidelines – so easy! Since most cornbreads are served with butter, I made these with a generous amount of butter in them. That and the sticky sweetness from the dates and the syrup means they are good just on their own. Method Mix the cornmeal, baking powder and salt in one bowl and in another the eggs, milk and melted butter. Combine the two mixtures well and allow to stand for about 10 minutes. Divide the butter into 18 pieces, one for each muffin, and place in muffin tins. Do the same with the syrup. Pit the dates and cut them in half lengthwise. Place them on top of the butter maple mixtures with the cut part facing up. Spoon the batter into the muffin tins. Bake at 450 degrees F for about 12 minutes, or when they spring back when pressed. Remove from the oven, loosen with a knife and invert then onto a rack to cool. These could be made just as well in a cake or loaf tin. If you don’t have maple syrup, another sweet syrup or honey can be used. Categories: baking, snacks | Tags: butternut syrup, cornbread, Fiesta Friday, gluten free, maple syrup, upside down cornbread | Permalink. 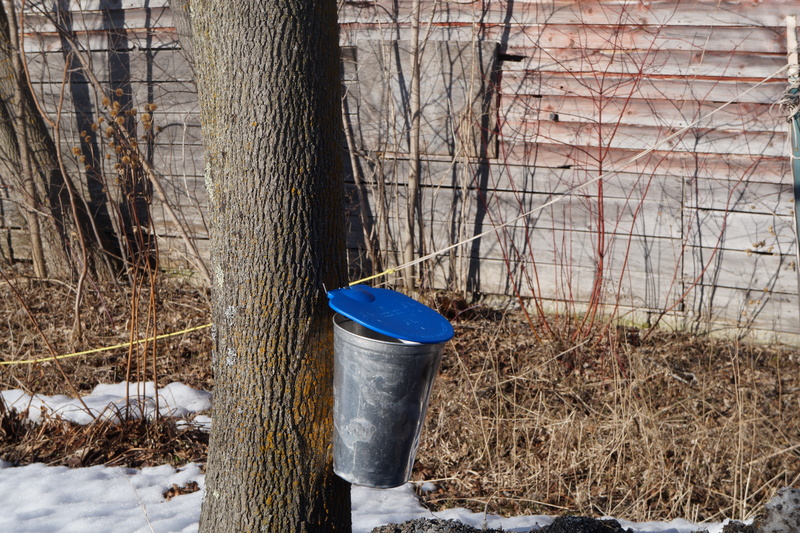 Here in Ontario maple syrup season is in full swing, and for the second year we are beginning to boil down the sap from our sugar maples and a few Norway maples too. The latter don’t provide as much sap, and it will not be as sweet, but once we’ve set up the apparatus, may as well make use of what is available to us. We managed to find some second-hand metal buckets which I like much better than the blue plastic ones we already had from last year. We also have a new sugar shack, which is actually the now-empty wood shed. We are following the same process as last year which you can read about here. My blog has been dormant for a while. We were off in Spain for a couple of weeks, and my arm still keeps me from doing much in the kitchen, so as I cautiously resume my adventures in backyard foraging, I wanted to bring something pretty special to Angie’s Fiesta Friday. This recipe is special because it uses the most iconic of all Ontario’s products, but in a way which is thoroughly innovative, fun, and Delicious. I got the idea from an esteemed fellow blogger, Poppy, at Bunny Kitchen who shared an extraordinary idea for making a fluffy chocolate mousse out of the liquid from unsalted canned chickpeas. It seemed a bit risky to me, but her gorgeous pictures convinced me I should give it a try. Since she’d already proven the technique with her own chocolate version, I had to try it with maple syrup, and lots of it. I used dried chickpeas, soaked and cooked them in the usual way. Once cooked, I chilled them, then poured off the liquid. From about one and a half cups of peas, I had one cup of liquid which, as it turned out, was plenty. Using a hand mixer I beat the liquid for about ten minutes. I then added 1/2 tsp guar gum, 100 ml of sugar (I used maple), and gradually added 250 ml maple syrup, beating all the while. This is what it looked like – about two litres in all. As promised, this made a super light and delectable mousse. With all the maple, no hint of bean flavour came through, and the maple flavour was strong but the sweetness somewhat tempered. Perfect for so many things! On its own, it was a delicious dessert, but I also wanted to see how else I could use it. Here are 3 ways I served it. 1. As a garnish for a fruit pie. 2. As icing for cupcakes. 3. As a dessert layered with banana walnut cake and topped with some violet syrup I had from last spring. I also tried freezing it to make ice cream, adding a little more syrup to make a swirl, but it didn’t really freeze – just got colder. Some tips to consider when making this dessert. A little goes a long way. Try to calculate how much you’ll actually need. The topping on the cakes has kept well beyond a day, but what was left in the bowl began to separate and lost some of its frothiness. Beating it again solves the separation problem, but it is no longer as airy. The mixture is too thin to make a heavy frosting capable of holding its shape, so allow for some runnyness. Any sweetener would work with this. Just add gradually and taste as you do so. There are plenty more possibilities I can think of for using this technique and I expect to have some fun with it. I hope you do too. Categories: dessert | Tags: chickpeas, dessert, Fiesta Friday, foraging, frosting, maple dessert, maple mousse, maple syrup, vegan cream | Permalink.